The Postal Numeric Encoding Technique (POSTNET) is a barcoding system developed by the United States Postal Service to assist with automatic mail sorting and routing. The POSTNET barcode uses a combination of half-bars and full-bars to encode the zip code that appears on a mail piece. The barcode starts and ends with a full bar (often called a guard rail or frame bar and represented as the letter "S" in the USPS TrueType Font). In the United States, zip codes can be of 5 digits, 9 digits (also known as Zip+4), or 11 digits in the case of a specific delivery point. Each digit in the zip code is represented by 5 bars. Therefore a 5-digit zip code is represented by 25 bars. In addition, to ensurePOSTNET accuracy during mail processing, a check digit, which is five bars, is calculated and added to the zip code. Hence a 5-digit zip code would render a total of 32 bars: 25 bars for the 5-digit zip code + 5 bars for the check digit + the 2 enclosing guard rail bars. Hence, Zip+4 uses 52 bars, and a delivery point uses 62 bars. To add zip code barcoding capabilities to a Report Writer report, for example an Invoice or a Check, you must first download and install the fonts. You can get a set of fonts from here. To install the fonts (the TTF files in the zipped file), extract the fonts to your My Documents folder, then copy them to your Windows\Fonts folder. 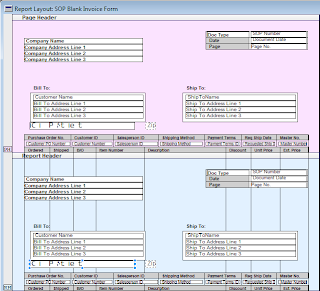 1) Open Report Writer and select the SOP Blank Invoice Form. Click the Layout button to open the report in the Layout window. 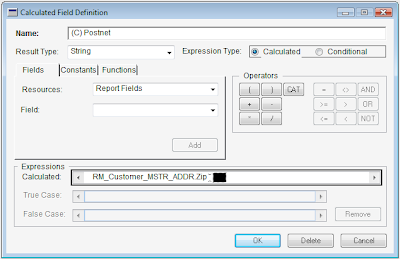 2) Add the RM_Customer_MSTR_ADDR.Zip field to both Report Header and Page Header sections. Set the fields properties to Invisible. 5) Add the report to VBA. Go to Tools > Add Report to VBA. 6) Select all 4 fields, the 2 on the report header and the 2 on the page header and add them to VBA. Go to Tools > Add Fields to VBA. sZip = sZip & CStr(checkDigit) & "S"
8) Return to Microsoft Dynamics GP saving all changes as you exit. 9) Grant security to the modified report. Print an invoice to test. I hope you found this article interesting and the implementation very simple. You can find the fonts and package file for this project at the bottom of this article. How can you get this on a Word Template? Barcodes are just a type of font. You can simply download a font pack for word then change the font on the template. You will then need then save the template into a folder and reimport into GP.